In 1999, New York City Council Speaker Peter Vallone Sr. (a Queens Democrat) appointed Republican Andrew Eristoff to lead the council’s Y2K task force, because he just didn’t have anyone in his conference he confidently entrust with the job. That is how seriously we took potential Y2K glitches at the time. You might think everything worked out fine in hindsight, but don’t be so sure about it. Regardless, Abner “Abbie” Harmeyer is not thinking about anything that responsible. He will spend the time leading up to the turn of the millennium (and potential catastrophe) trying to master the infamous level 256 in the old school Pac-Man game. 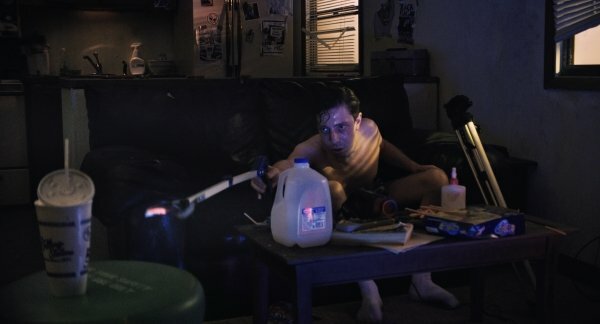 The slacker lifestyle goes from drearily depressing to downright apocalyptic in Joel Potrykus’s Relaxer, which opens this Friday in New York. Harmeyer is a reluctant accomplice in his abrasive brother Cam’s bullying, because he obediently accepts every asinine challenge the blowhard serves up. That makes Abbie the bigger dummy. The latest is particularly pointless, futile, and potentially self-destructive. Poor Abbie cannot get up from his couch until he masters the infamously glitchy level 256 in the old school Pac-Man video game. Of course, he has a deadline: Y2K. To perform at his best, Harmeyer will need fuel, so he will try to convince Dallas, a lowlife buddy, to bring over a Chuck E. Cheese pizza and some cherry soda, but alas, his credit is not very good. If you can find a film with characters that are more irritating than those in Relaxer, then you have our sincerest sympathies. Watching this film will make you understand the compulsion animals have to chew off their own legs when they are caught in a trap. Potrykus definitely has a low-fi, grungy aesthetic, but he still managed to craft a distinctive mood piece in The Alchemist Cookbook. 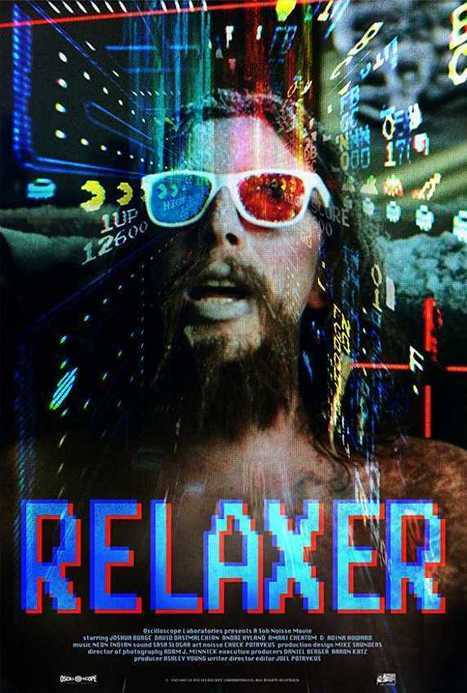 In contrast, the only tension produced in Relaxer is that experienced by viewers eager to escape this slacker purgatory. It is a shame, because Potrykus’s old school analog elements (level 256, video game champion Billy Mitchell’s challenge, retro Y2K fears) have potential. Frankly, this kind of material should be like a hanging meatball in Potrykus’s power-zone, but Relaxer completely whiffs the nostalgia. Instead, the film is all about how low and cringy can Harmeyer get. Joshua Burge goes all in as Harmeyer. His commitment is impressive, but hard to watch. Consider this fair warning: the sight of the clammy, shirtless Burge is probably something most rational people would prefer to spare themselves. Yet, as Cam and Dallas, David Dastmalchian and Andre Hyland appear to be locked in a death struggle to prove which can be the most annoying. Relaxer takes a weird left turn late in the game that ought to be a mind-blower, but really just feels like a cheat, because Potrykus never lays an adequate foundation for it. Not recommended, Relaxer opens this Friday (3/22) in Grand Rapids at the Urban institute for Contemporary Arts and next Friday (3/29) in New York, at the Cinema Village.